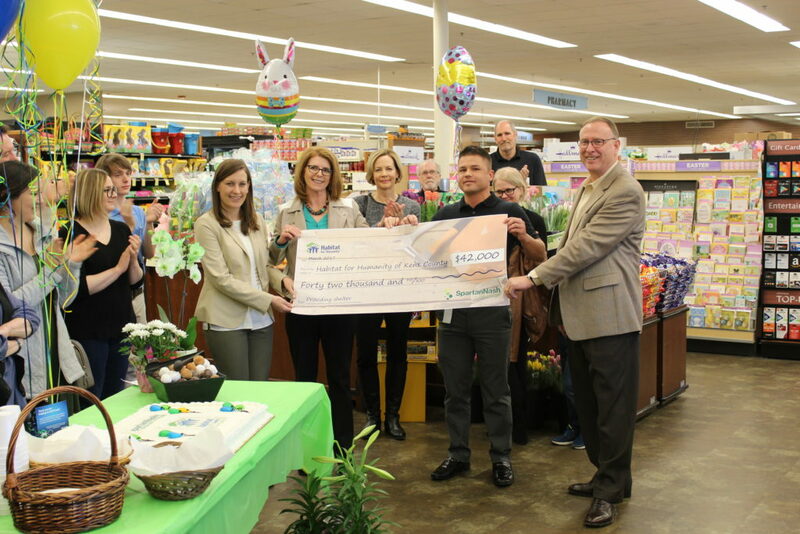 GRAND RAPIDS, Mich. – As a result of Habitat for Humanity of Kent County’s partnership with the SpartanNash Foundation and 30 Family Fare Supermarkets, D&W Fresh Markets and Forest Hills Foods stores and Quick Stops in Kent County, the local Habitat affiliate today received a $42,000 donation. The donation – which took place on April 7 at the Forest Hills Foods located at 4668 Cascade Road in Grand Rapids – will help local veterans build and repair their homes. From left: Habitat for Humanity of Kent County Executive Director BriAnne McKee; Meredith Gremel, Vice President, Corporate Affairs and Communications for SpartanNash and Executive Director of the SpartanNash Foundation; Habitat Kent Development Coordinator Sue Buzzell; Forest Hills Foods Store Director Ricky Myers; and Bruce Emery, Divisional Vice President, Retail-East and Habitat Kent Board Member. Between Feb. 8 and 19, the SpartanNash Foundation hosted a companywide retail scan campaign in SpartanNash corporate-owned stores in eight states. Store guests and company associates who visited the stores during the 12-day retail scan campaign had the opportunity to donate $1, $5 or $10, with 100 percent of dollars raised going to support 79 Habitat for Humanity affiliates such as Habitat for Humanity of Kent County. Habitat Kent’s Veteran Program empowers the local veteran community through homeownership, home repair and mentorship. Since 2011, Habitat Kent has served more than 70 veterans and partnered with veteran families to build six homes, with two more currently in construction. Through financial support – such as today’s donation from the SpartanNash Foundation and the 30 Family Fare Supermarkets, D&W Fresh Markets and Forest Hills Foods stores in Kent County – volunteering or adding a voice to support affordable housing, everyone can help families achieve the strength, stability and self-reliance they need to build better lives for themselves. SpartanNash – which owns the Family Fare Supermarkets, D&W Fresh Markets and Forest Hills Foods – underwrote the cost of the fundraising campaign so that all donations will benefit Habitat for Humanity of Kent County.